I wanted to take time to let you know how you and your staff have helped to permanently change my life. After my personal health consultation, you gave me a lot to think about as well as a stack of forms to fill out. 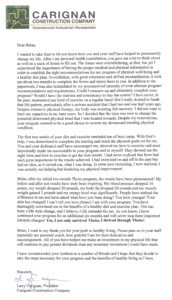 The forms were overwhelming, at first, but yet I understood the importance of having the proper medical and physical information in order to establish the right recommendations for my program of physical well-being and a healthy diet plan. Nevertheless, with great reluctance and skilled procrastination, it took me about two months to complete the forms and return them to you. In addition to the paperwork, I was also intimidated by my preconceived intensity of your ultimate program recommendations and requirements. 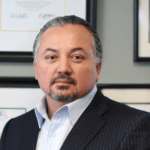 Could I measure-up and ultimately complete your program? Would I have the stamina and consistency to stay the course? I have never, in the past, maintained any kind of exercise on a regular basis! But I really desired to break that life pattern, particularly after a serious accident that I had two and one half years ago. Despite extensive physical therapy, my body was resisting full recovery. I did not want to limit my capacities in my later years. So I decided that the time was now to change the potential downward physical trend that I was headed towards. Despite my reservations, your program seemed to be a good choice to reverse my downward trending physical condition. The first two weeks of your diet and exercise reminded me of boot camp. With God’s help, I was determined to complete the training and reach the physical goals set for me. You and your dedicated staff have encouraged me, showed me how to exercise and most importantly made me accountable to your program and to myself! They showed me the right form and how to exercise to get the best results. I had never realized that form had such great importance in the results achieved. I had exercised on and off in the past but had no idea, as it turned out, what I was doing. In some past exercising, I now realized, I was actually not helping but hindering my physical improvement. 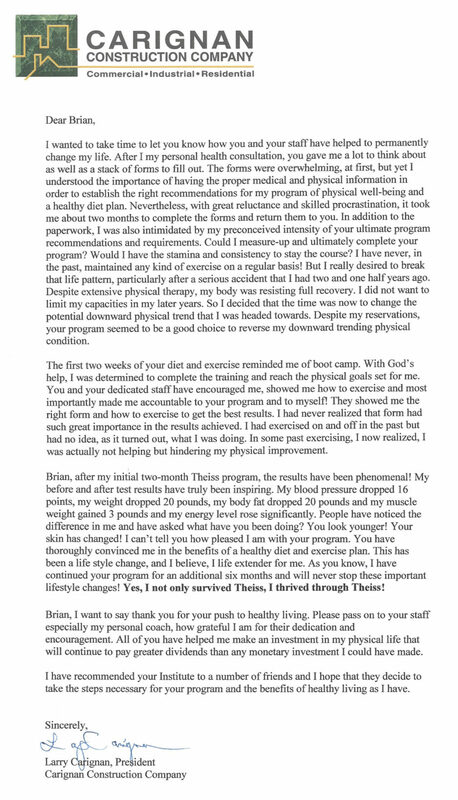 Brian, after my initial two-month Theiss program, the results have been phenomenal! My before and after test results have truly been inspiring. My blood pressure dropped 16 points, my weight dropped 20 pounds, my body fat dropped 20 pounds and my muscle weight gained 3 pounds and my energy level rose significantly. People have noticed the difference in me and have asked what have you been doing? You look younger! Your skin has changed! I can’t tell you how pleased I am with your program. You have thoroughly convinced me in the benefits of a healthy diet and exercise plan. This has been a life style change, and I believe, I life extender for me. As you know, I have continued your program for an additional six months and will never stop these important lifestyle changes! Yes, I not only survived Theiss, I thrived through Theiss! Brian, I want to say thank you for your push to healthy living. Please pass on to your staff especially my personal coach, how grateful I am for their dedication and encouragement. All of you have helped me make an investment in my physical life that will continue to pay greater dividends than any monetary investment I could have made. I have recommended your Institute to a number of friends and I hope that they decide to take the steps necessary for your program and the benefits of healthy living as I have.